Remington Steele was 60 minute crime drama series on NBC about an attractive, intelligent woman who opens her own detective agency and finds that no customers will hire a female detective. In order to "fix" her problem, she renamed her agency from "Laura Holt Investigations" to "Remington Steele Investigations" and told everyone that she works for a mythical "Mr. Steele". Although her business picks up dramatically, all of her clients eventually want to meet her employer (who doesn't exist). As the pressure is building beyond her ability to deal with it, she meets a handsome man with just the right amount of class to play the part of Remington Steele. He convinces her to make him her partner and the story begins. Early in his career, Pierce Brosnan was often compared to a young James Dean. Doris Roberts real life home was formerly owned by James Dean. Stephanie Zimbalist is the daughter of actor Efrem Zimbalist Jr., perhaps best-known for his role as Inspector Lewis Erskine on the 1965 TV show, "The F.B.I.". He also worked with his daughter several times on Remington Steele. 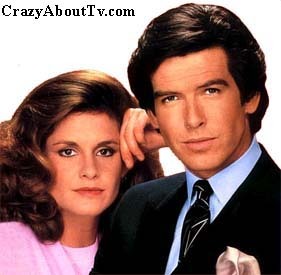 NBC canceled Remington Steele on May 15, 1986 at the end of the 4th season. That very same day, the New York Post reported that Pierce Brosnan had signed to be the new "James Bond" on May 14, 1986. Unfortunately, NBC still had a 60 day option to renew the show with Brosnan still under contract. The news of his selection as "Bond" caused much interest in the summer reruns of "Remington Steele" and the network decided to produce a few more episodes causing Brosnan to lose the role in "License To Kill" to Timothy Dalton. Stephanie Zimbalist also lost the role of Anne Lewis in the movie "Robocop" to Nancy Allen for the same reason. Doris Roberts ("Everybody Loves Raymond") was nominated for an Emmy in 1985 (Outstanding Supporting Actress in a drama series) for her role on the TV show as Mildred Krebs. Remington Steele was apparently a Humphrey Bogart fan. He had five counterfeit passports (till taken away by Scotland Yard). Each one was in the name of a character played by Bogart in the movies. The exterior shots of the buildings that held the Remington Steele Investigations offices were actually the "Century Plaza Towers" in Century City, California. Many future stars appeared on Remington Steele before they were famous. Some examples are: Geena Davis (Geena Davis Show), Jonathan Frakes (Star Trek: The Next Generation), Paul Reiser (Mad About You), Sharon Stone, and Nana Visitor (Star Trek: Deep Space Nine). "Try this for a deep dark secret: The great detective Remington Steele-he doesn't exist. I invented him. Follow: I always loved excitement and so I studied and apprenticed and put my name on an office. But absolutely nobody knocked down my door. A female private investigator seemed so ... feminine. So I invented a superior, a decidedly masculine superior. Suddenly there were cases around the block. It was working like a charm. Until the day he walked in, with his blue eyes and mysterious past. And before I knew it, he assumed Remington Steele's identity. Now I do the work and he takes the bows. Its a dangerous way to live, but as long as people buy it, I can get the job done. We never mix business with pleasure. Well, almost never. I don't even know his real name." Thank you for visiting our Remington Steele page!